Our House Of Palms Will Make Your Next Stay In Las Vegas Unforgettable! Casa delle Palme (House of Palms) will make your next stay in Las Vegas unforgettable. Whether you’re in town for business or pleasure you will find that this home suits all of your needs. This three bedroom three bathroom home with a large loft will easily accommodate your group in style and comfort. Get a good night’s sleep in the tastefully appointed bedrooms, cool off in the private pool and spa, cook a delicious meal in the chef’s kitchen, visit and enjoy each other’s company in the lounge and at the dining table that seats ten. You will find that Casa delle Palme is close to everything that Las Vegas has to offer. It’s a short drive to the airport (20 minutes), downtown (20 minutes), the strip (25 minutes), and other fabulous attractions. Local casinos, golf, and dining are all within a short ten minute drive. Casa delle Palme comfortably sleeps ten. There is a ground floor bedroom with a queen bed that has an adjoining full bathroom complete with tile flooring and a granite counter top. Upstairs is the master bedroom with a king size bed and en suite bathroom that includes travertine flooring, a granite counter top, and a large soaking tub. This spacious area has a Smart flat screen TV in the armoire, DVD player and a large walk in closet. Also upstairs is another bedroom with a queen size bed, a full bath room with a granite counter top and travertine flooring, and a laundry room with a state of the art washer and dryer set. The large loft has two sets of bunk beds, a sectional couch, and a large TV with DVD player. There are games and puzzles for everyone to enjoy. The chef’s kitchen boasts granite counter tops, stainless steel appliances, and a gas stove for creating wonderful meals. There is a breakfast nook as well with seating for five. Open to the kitchen is a family room with a leather reclining sectional, a flat screen Smart TV, and a gas fireplace. The lounge and dining area features a bar and an elegant formal dining area with seating for ten. WiFi is available throughout the house and there is a ping pong table in one bay of the three car garage. You’ll love the gorgeous, spacious, and private back yard. The many palm trees and lush landscaping are meticulously maintained. A covered patio offers shade from the desert sun. Cool off in the pool during the day and relax in the spa at night. The cascading water from the spa to the pool is tranquil and inviting. A patio set and a gas grill add to the enjoyment of this outdoor space. This home is conveniently located. The quiet neighborhood setting is away from the congestion and often racy downtown area and Strip which makes it perfect for families. Yet it’s a short drive to take in a show, eat at a world renown restaurant, or enjoy the gaming and excitement that the nearby Fremont area or the Las Vegas Strip have to offer . Additionally, Casa delle Palme is only a ten minute drive to several local casinos such as Sante Fe Station, the Marriott, the Suncoast, and the Redrock Casino. There are also numerous restaurants nearby ranging from fast food to world class cuisine just minutes away. You will also find shopping, many golf courses, Red Rock Canyon, Mt. Charleston, Hoover Dam, the Las Vegas Motor Speedway, and many other amenities within easy access from this great property. Be sure to stay at Casa delle Palme during your next visit to Las Vegas. The serene neighborhood affords safety and privacy and the size and layout of the house will allow everyone in your group plenty of space. Come make memories at Casa delle Palme! Please note: No parties are allowed. Choosing Casa delle Palme was easy. 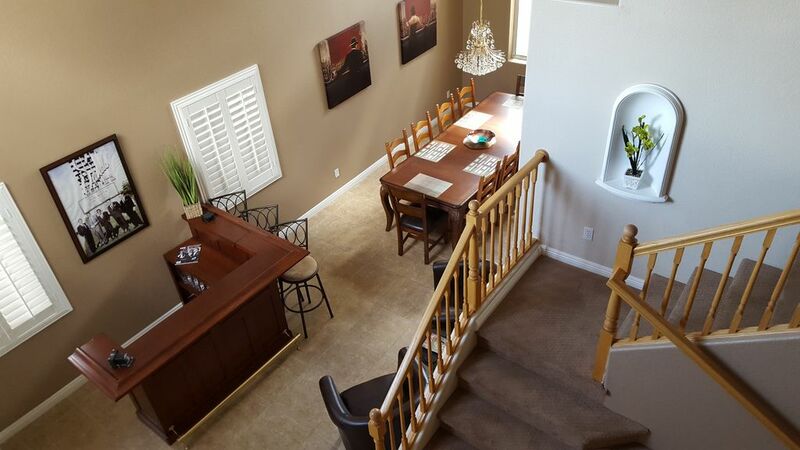 Not only is the layout of the home conducive to families, extended families, and groups but it is located in a quiet neighborhood that is close to everything yet far enough away from the noise, congestion, and adult themes of The Strip and Fremont Street. The big draw, of course, was the oasis like back yard. The cascading water fall from the spa to the pool combined with the lush vegetation and mature palm trees creates the feeling that you are in a beautiful and relaxing private resort. When you factor in the upgrades such as granite counter tops, tile, and travertine plus the chef’s kitchen and dining room with seating for ten you come to the conclusion that Casa delle Palme is the ideal Las Vegas vacation retreat. Casa delle Palme is unique due to the lush desert oasis backyard. From the cascading waterfall from the spa to the pool to the manicured landscaping and mature palm trees each guest will feel like they are at their own private luxury resort. The property boasts granite counter tops, tile, and travertine plus a chef’s kitchen and seating for ten in the dining room. There is also a family room, loft, and a lounge. The location of Casa delle Palme is ideal. It is located in a quiet neighborhood that is close to everything yet removed from the noise, congestion, and adult themes of the The Strip and Fremont street. Redrock Canyon, casinos, restaurants, and shopping are all within ten minutes of the property. The house was a great place for us to stay with good proximity to hiking places. Small issue with the hot tub and we had to buy a new corkscrew for opening wine. Other than that a great house for old friends reunion. Beautiful home, very clean, quiet neighborhood, and great pool area! We were in Las Vegas for soccer games and the house was less than 10 minutes away. Had a total of 10 people and everyone enjoyed their stay. Ping pong table was used, but the air was too chilly for swimming. Great Spot to enjoy Las Vegas! We had a wonderful time while we were in Las Vegas for our son's wedding. The house was a big part of that!! It was so nice to be together and just be able to hang out, eat, rest etc!! While we had snow and cooler temps we were still able to enjoy the hot tub numerous times. The house was very welcoming, very well equipped ( especially the kitchen, which I really appreciated!) Kristine was always easy to get in touch with before, during and after our stay! Very easy access to downtown and the strip as well as going out to Red Rock Canyon. I left my jacket there, As I write this, it is in the mail. I greatly appreciate the willingness to return it to me. We were a travelling group of 3 families (including 3 kids and one infant). We stayed here for 3 nights. - Can't beat the location (in a quiet neighbouhood, easy to access, lots of amenities around). - Laundry was fantastic, and there was plenty of dry towels for everyone! - We definitely left the place in better condition than when we arrived (I don't think the previous renters followed the check out instructions). - There was miscommunication about the pool settings but they were resolved the next day! - An issue with the wifi strength. - The main floor is not ideal for an infant, but the upstairs was great. - I would recommend getting board games and cards for the adults; everything was geared towards younger kids. Overall the place is a decent value, but it is starting to show its age. It's been rented since 2006 and you can tell. Thank you for taking the time to write a review Maryana. I appreciate most of your comments. I do, however, take exception to the end of your review in which you wrote that "the house has been rented since 2006 and you can tell." That statement is absolutely incorrect. The house has only been rented since 2015. Furthermore, I had the house re-carpeted two months ago. It was at that time that some interior painting was done and some of the linens and towels were replaced. Your comments infer that the house is shabby and that is not an accurate representation whatsoever. I eagerly seek out feedback but what I don't appreciate are misleading and erroneous comments. The "miscommunication" regarding the pool and spa was on your end and as a result I incurred an extra expense with the pool company. I ordinarily would not make a point of mentioning that but I feel I must rebut your assertions. Please feel free to contact me if you travel to Las Vegas in the future and I would be happy to help you find a property that is more suitable. Kristine. Rates are subject to change until reservation is confirmed. Tax rate is 13% tax and 2.9% credit card convenience fee. Up to $50 per night for heated pool charge (seasonal).